This is the post where we share some of the things that were discussed in our latest meeting. Usually I brush over a number of topics, but this time I’m going to choose an issue that comes up frequently and go into a little more depth than usual. That topic is all about choosing a good place to end a chapter. In our group, we often critique entire chapters of a novel at our meetings. While there are some drawbacks to critiquing small sections at a time, one of the advantages is that it’s easy to discuss whether the end of the chapter leaves us wanting to read more. The best ending places for a chapter are the ones that carry forward momentum–the ones that leave the reader dying to know what happens next. To find these momentum-filled spots, it’s helpful to think of the scene-and-sequel cycle that repeats itself over and over in a novel. The scene is the part of the cycle where action and dialogue takes place. A scene begins when the protagonist has a goal and attempts to achieve it. Those attempts are met with conflict and obstacles, which results in a disaster or revelation of some sort. The disaster can come because the main character is not able to achieve the goal, or because achieving the goal has unexpected negative results. Either way, something should worsen at the end of the scene (that is, until we reach the story’s resolution toward the end of the book). After the disaster or revelation, the protagonist has to take some time to react. In writing terminology, this is called sequel. These sections tend to be heavy on interiority, meaning they take a lot of time showing the character’s thoughts and emotions in response to what just happened. The situation has worsened, and the protagonist has to reevaluate the situation. Does he continue with his goal in another attempt? Does she switch to a different goal altogether? It’s important for the reader to understand what’s going on in the protagonist’s head. Once the protagonist has processed the latest development, he or she makes a decision as to what to do next. As the protagonist forms a new (or revised) goal and attempts to achieve it, that launches another round of the scene-and-sequel cycle. Once you get a feel for the rhythm of this cycle, it feels very natural, like inhaling and exhaling. When the flow of the story is broken down like this, it’s easy to see that the two best places to end a chapter are either right after the disaster happens (at the end of the scene) or right after the new goal has been decided (at the end of the sequel). These two spots are marked by the red stars in the chart. They are the moments when the anticipation swells–the way you feel when you’ve been holding your breath, or pausing before you take the next one. 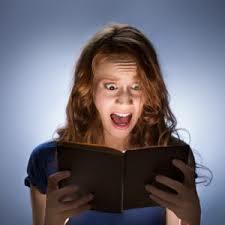 After the disaster or revelation, the reader wonders how the protagonist is going to deal with the latest development. After the protagonist chooses a new goal, the reader is wondering how this new attempt is going to turn out. In terms of word count, the scene half of the cycle (the attempts to achieve the goal along with the resulting disaster) typically gets a lot more page time than the sequel half (the character’s thoughts and emotions in response to what has happened). The chart above shows six equal parts, but that just represents the fact that each plays an equally important role. However, writing the active parts of the scene will generally require substantially more time and words than writing the thoughts and emotions will. An adept writer can play around with how much time is spent in each half of the cycle in order to slow down or speed up the pacing. This is a powerful tool, I’m telling you! These steps act as the building blocks of a novel. Of course, the pattern is never exact and writers can apply it in unique ways. When a writer skillfully connects repetitions of this cycle, the story will flow and escalate in a satisfying way. 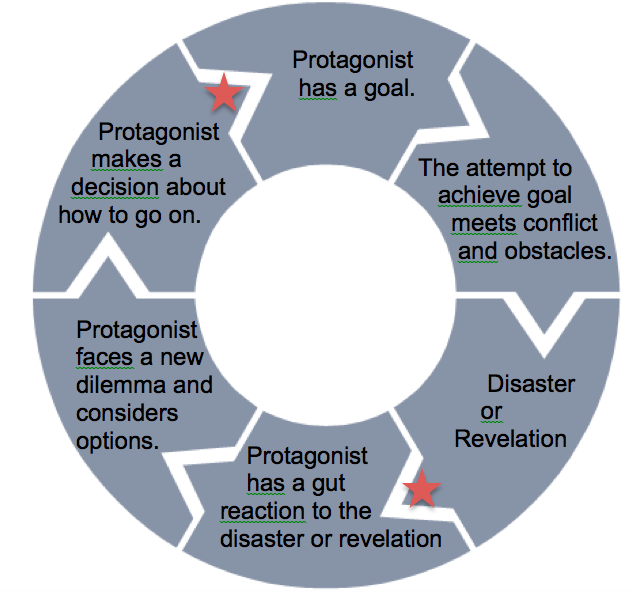 Look for variations of this cycle in your favorite novels. Try it with your current project. You’ll be surprised at how much clarity and flow it will bring to your story. Ask An Author: What children’s literature character are you most like?